The Detroit waterfront was recently aglow at Moonlight Yoga on the Riverfront, a unique twist on yoga classes. 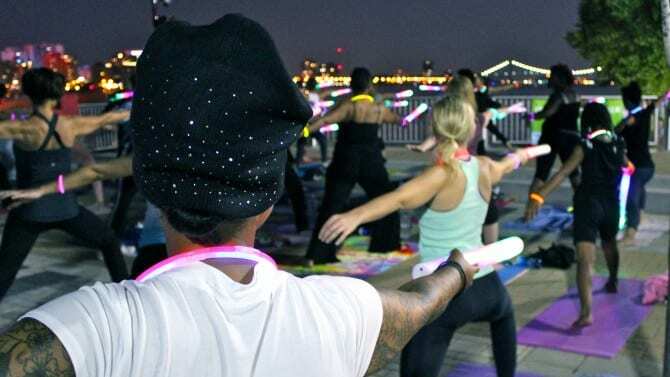 Throughout the moonlit evening, participants went through traditional yoga posses with 16-inch lighted batons and glowing jewelry. The free class, led by local yoga instructor Michelle Moten of Detroit’s Urban Solace, was part of Live The Riverfront, a multi-year partnership between Blue Cross Blue Shield of Michigan and the RiverFront Conservancy. Throughout the summer, Live the Riverfront has helped get more people active on the RiverWalk through free fitness programming including Walk the RiverWalk Wednesdays, the BCBSM 5K/10K and weekly yoga and T’ai Chi classes. A big thank you to Michelle and everyone else who came out for this class!